This entry was posted in Minutemusic and tagged folk, jazz, video. Bookmark the permalink. 5 Responses to To Whom Does a Noise Narc Narc? To the Jazz Police. Look at that f-ing Williamsburg hipster wail. I agree, he does kill it: but I just hate the style so much it’s hard to acknowledge. 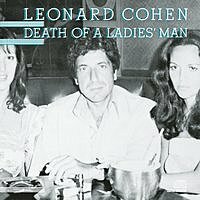 I was just thinking this morning that I don’t know enough of Leonard Cohen’s catalog beyond the first three albums. So, queue it up, Mog. Correction: it does. Thanks, Mog, for your fantastic search. Heh. Guess I should have investigated that myself. After watching this video it occurred to me that I’m pretty much in that same boat being fairly ignorant of Cohen’s later stuff, though New Skin is still an early one where he’s just starting to change his sound. I like a couple tracks from I’m Your Man, like “First We Take Manhattan” and “Everybody Knows,” but the rest of it sort of blows, I think. And I couldn’t even make it all the way through Dear Heather when that came out. Yeah, I mean, I’ve listened to quite a few of the other albums, but always just in passing. I now realize I’ve listened to both Death of a Ladies Man and New Skin, just very flittingly.